Summer is one of my favorite times of year for bringing people together. The vibrant colors require a certain feeling of happiness and need for cheer. Spread your summer cheer with a casual centerpiece. The centerpiece is a great way to anchor any tablescape, as long as you incorporate consistent textures and tones. Without overshadowing the rest of your setting, arrange an assortment of the season’s bounty, beautifully bold blooms and vegetation, to infuse the laidback feel of summer into this distinctive centerpiece. We started with a rustic box. 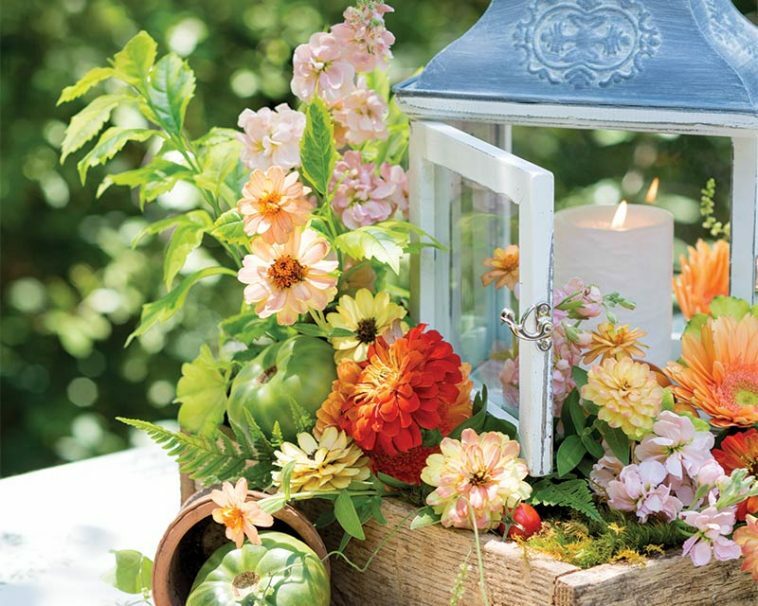 A vintage-inspired lantern was set in the center as our eye-catching piece. From there, you can let your imagination guide you. Choose a mix; we selected a blend of zinnias in pale yellow, peach, and burnt orange, as well as gerbera daisies, stock, geranium leaves, and ferns. To finish, scatter additional fresh produce with vibrant hues like heirloom tomatoes, which are what we used, to add variety and added levels of interest. 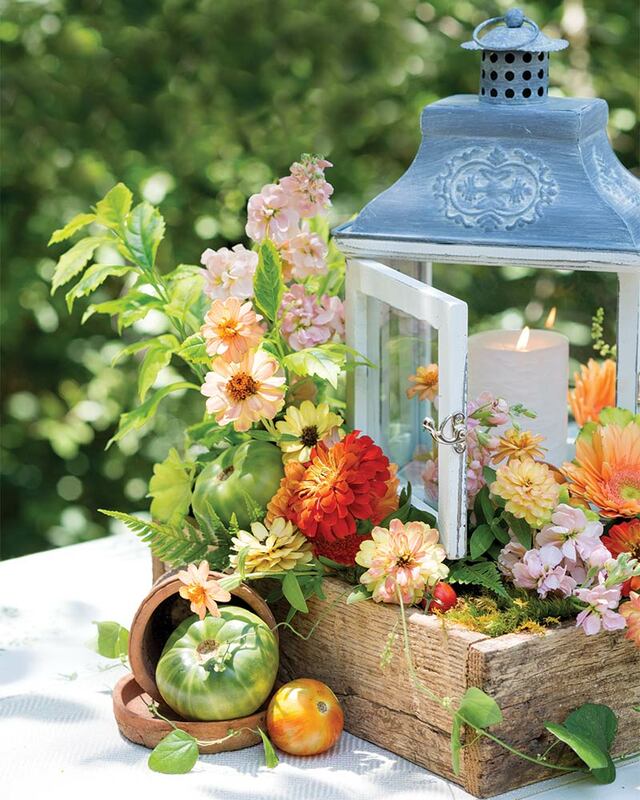 The wonderful perk of using a lantern, as a part of your centerpiece, is that the arrangement will double as a source of delightful illumination. So as you and your guests enjoy the evening, you will have extra light! Which season is your favorite for entertaining? Beautiful pictures! Made me smile! Fall is my very favorite time of year! Here in North Texas, we do not get the glorious Fall flavor that other areas of our beautiful nation get to experience! Most often, we go straight from hot, hot, hot into cold and rainy! 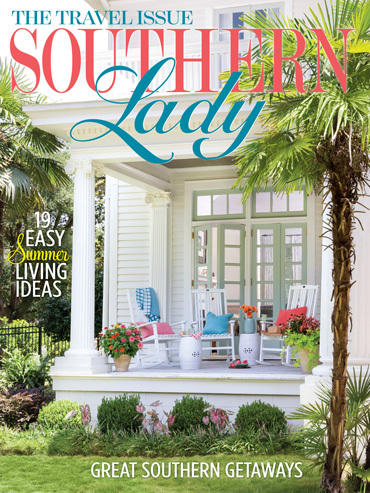 During Fall, I live vicariously through the pages of my Southern Lady and Victoria magazines! There is nothing softer and more elegant than candle light; your Zinnias and tomatoes look so wonderful together inside the lantern. We are lucky in the south and can extend the summer growing season. Think I’ll dust off my lantern and re-create a version of your lovely arrangement and have the girls over for lunch. Thank you for reminding us of the simple beauty of candles and flowers even in late summer. We have several passion flower vines volunteering and then accumulated over the last several years and the fritillary butterfly lays it’s eggs only on this type of vines. The last two years we have had a lovely Butterfly Tea outside by the vines timed to celebrate the newly emerged butterflies and cheer on fat caterpillars still forming cocoons. It’s been a joy to sip tea with butterflies fluttering all about, celebrating their new wings. This is the perfect arrangement for the occasion. We will attempt to shamelessly copy your idea for the centerpiece! And tuck in a faux butterfly here and there. although Spring comes in a very close second. Each season of course is unique but the rich fall colors are always very welcome after a long hot Texas summer. The greens and floral offerings of Sping bring such a sense of renewal. I appreciate each of the 4 seasons for the varied offerings , but Autumn evokes special feelings of warmth, family and friendship . Is it the clearness of the days , the crispness of the evenings , the saturated colors of golds,bronzes,oranges and browns ? All of the above I’d say ! Come fall , it seems I want to bake and prepare comfort food for those I love . I look forward to decorating the inside and outside of my home to showcase Autumn’s loveliness . It is disappointing when this season is rushed through to get to the next holiday . What a beautiful addition to a summer table, very pretty. Thank you for the wonderful idea Phyllis. Summer is not my friend. I keep cool reading Southern Lady, Victoria, Tea Time Celebrations and saving Southern Celebrations Autumn for last. With HM’s help summer will go quickly and fall is around the corner. Then my friend winter. Enjoyed the look of the table. Thank you Phyllis. Beautifully done. Love the tomatoes. I think fall is my favorite. I love the changing seasons however. My favourite season would be fall…I prefer the cooler days,less humidity and bug activity. The centrepiece is indeed beautiful and I think with a few switches, for example, gourds instead of tomatoes, it serves as inspiration for any season really. Thank’s so much Phyllis. My favorite holiday is Thanksgiving so I would have to say autumn. I’ve had to promise myself not to buy anymore fall decor items for awhile. I love to set an autumn table with mini pumpkins, gourds, and leaves. I also most enjoy making hearty soups and stews when the weather is chilly outside. This is such a charming arrangement, perfect for summer, perfect for outdoors. I will admit that I am a Fall fan, and already longing for crisp days, but this centerpiece makes me agree that summer time is a lovely time to enjoy entertaining and flowers. What a wonderfully casual and elegant idea!!! Thank you for another great idea and the picture to go with it!